The 408A is a 100MHz Direct Digital Synthesized Signal Generator in a small table-top shielded enclosure. The 408A generates Sine/Cosine and ACMOS/TTL output signals simultaneously up to 100MHz in 1μHz steps under serial control. The RS232 interface uses simple text commands to control the module and allows non-volatile storage of all settings. 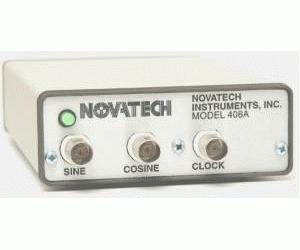 The 408A is equipped with a ±2ppm VCTCXO clock or it can be set to accept an external clock source up to 300MHz. Up to four Model 408A can be mounted in a single 1U rack using the optional rack adapter. The 408A operates from +5VDC supplied by a provided AC-line adapter. SOF8 host software included.